Long Beach Surfer's Association | The Official Website of The Long Beach Surfer's Association! Calling all Groms and Supergroms! Sign up NOW for the 2014 King and Queen of the Beach – Sept 7th! The 2014 King and Queen of the Beach contest presented by The City of Long Beach Department of Parks and Recreation and Skudin Surf is ON for Sunday, September 7th, 2014! The Long Beach Surfer's Association is a proud sponsor, and we're happy to be once again involved with this tremendous event held in memory of one of our founders, the great Danny Bobis. We would also like to thank the other sponsors, McAvoy Plumbing, Palazzo Construction, and unsOund Surf, along with the dozens of volunteers who help make this great event for our young surfers happen. Last year their efforts helped over 160 kids enjoy one of the best days of surfing with their friends and family we could have ever imagined – this year promises to be even bigger and better! Parents: Please register your grom early for this event! Pre-registration helps us tremendously! Click here to download an entry form, or click the image above! The LBSA encourages everyone to get behind Robert Browne and his family in their efforts to help him overcome the spinal cord injury he suffered while surfing here in Long Beach. Robert's courage and determination to regain full use of his arms and legs is inspiring, but he needs our help! Above: Robert with his Godfather, Bobby. Team Robert Browne was formed by friends and family in response to an unfortunate surfing accident. Our goal is to raise money in order to assist Robert and the Browne family in paying for medical and living expenses related to Robert’s disabling spinal cord injury. "On July 3, 2014, Robert started his day following his passion of surfing in his hometown of Long Beach, New York. To avoid colliding with, and potentially injuring a young lady, Robert dove off his board hitting a sand bar and shattering his C5 and C6 vertebrate with shards affecting his spinal cord suffering a serious spinal injury. Robert has lost the use of his legs and is restricted to a wheel chair, he is currently battling to regain use of his legs with physical therapy and has limited use of his hands." Also, on September 19th, 2014 all are welcome to come to the Casino Night benefit at Bridgeview Yacht Club in Island Park, hosted by the Testaverde Fund! Please consider donating and coming out for Casino Night – hope to see you all there! The 2014 Summer Surf Schedule is essentially unchanged from last year's schedule, with the permanent beaches in the east and rotating schedules through the west central area and the West End. As always, we ask all surfers to make sure you purchase and carry your beach passes and obey all beach park rules. See full schedule below. Beach Park and Beach Patrol rules and regulations. Continuing the successful policy from prior years, Surfing Beaches, Limited Hours Surfing Beaches, and other areas that are open to surfing will be marked clearly with yellow flags by the City of Long Beach Lifeguards, serving to visually notify residents and visitors where surfing is permitted. Beaches designated as All Hours shall be open to surfing at all times, 7 days a week. Beaches designated as Limited Hours shall be open to surfing until 12N, 7 days a week. Surfers are hereby instructed that when the yellow flags are taken down on a limited hours beach, surfing in that area has ended and they must exit the water promptly. Lifeguards shall give a 10 minute warning prior to taking the flags down to indicate when surfing hours are ending. Surfers on any beach who fail exit the water or promptly paddle or walk to an adjacent surfing beach when instructed by lifeguards or other beach park personnel shall be subject to fines. Continuing the policy of the last several years, surfing will be permitted on all other beaches at all times unless/until swimmers are present, at the discretion of the Chief of Lifeguards. Next LBSA General Meeting – November 4th, 2013 at the Long Beach Hotel! The next general membership meeting of the Long Beach Surfer's Association will be 7PM on November 4th, 2013 at the Long Beach Hotel. 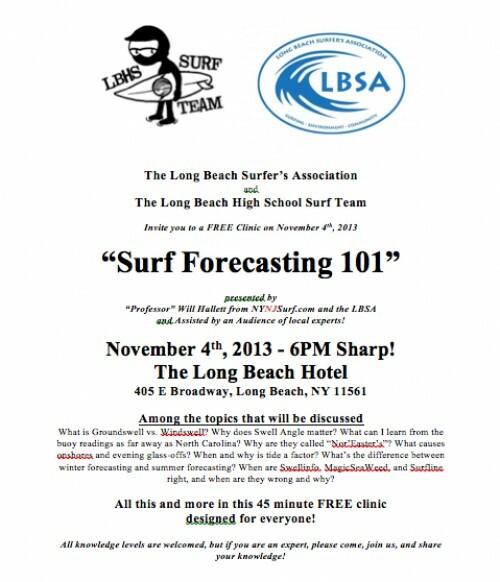 Prior to the meeting, the LBSA, in coordination with the Long Beach High School Surf team will be presenting a surf forecasting clinic: "Surf Forecasting 101" – All are welcome to attend! “A Hundred Miles to the End” to Premiere at the LB Library – July 13th, 2013 – get your tickets NOW! SMASH and the LBSA are proud to present the world premiere of John Beattie's surf film, "A Hundred Miles to the End" on July 13th, 2013 at the Long Beach Library! 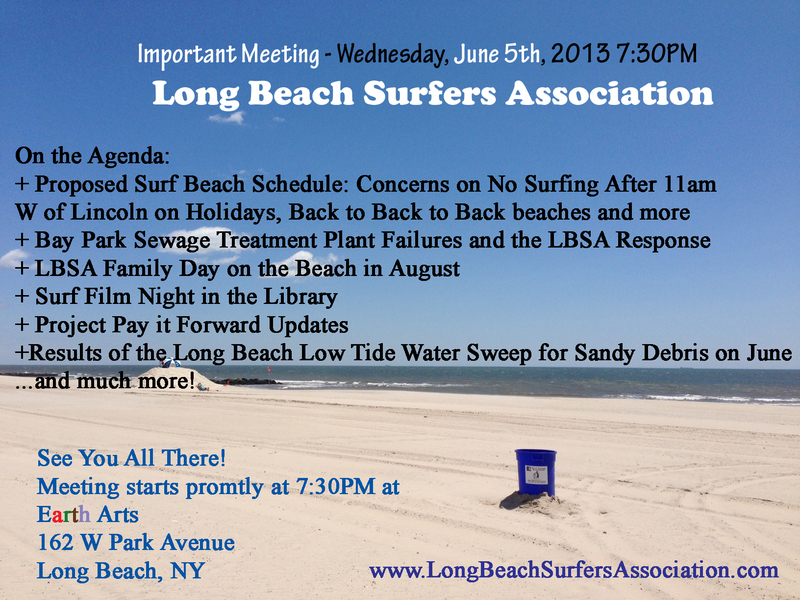 Important LBSA Meeting – Wednesday, June 5th, 2013 7:30PM at Earth Arts! Project Pay it Forward #11 scheduled for June 1st, 2013 – Come out and help out!